Drawing used by permission from Hilary Burn, map adapted from Turner 2006. 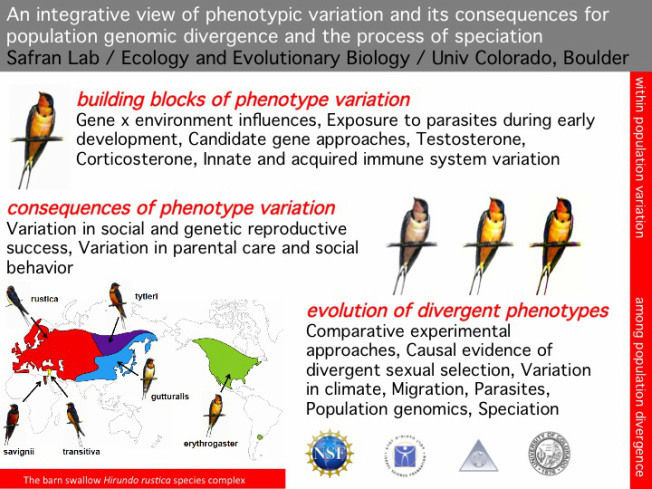 Our lab group uses a highly integrative approach to connect phenotype evolution to larger scale patterns within and among populations. We are particularly interested in the role of selection in the process of speciation and we study this through comparative experiments as well as genomic studies. Our recent work has included field experiments on mate-selection behaviors and traits (see ﻿Safran et al. 2016﻿) using social network approaches (see Levin et al. 2015, 2016 and Wilkins et al. 2015), quantitative genetics studies (see Hubbard et al 2015 and Jenkins et al. 2014), and phenotype and parasite manipulations (see Hund et al. 2015). Additional questions on phenotype and behavioral evolution are tied to physiological investigations (see Levin et al. 2016, Vitousek et al. 2016, Jenkins et al. 2014 and Jenkins et al. 2013). Large-scale sampling transects to analyze genomic and phenotype divergence offer a broader context to our fine-scale experimental research (see Safran et al. 2016 and Scordato et al. 2017). Additional reviews include the role of age (see Bradley et al. 2014) and migratory behavior (see Huber et al. 2016, Turbek et al. 2018) on phenotype evolution. The broader conceptual framework is critical to all of our empirical research. Recent examples include Trends in Ecology and Evolution articles (see Mendelson et al. 2016, Scordato et al. 2014, Wilkins et al. 2013, Safran et al. 2013, Turbek et al. 2018) and a Trends in Genetics article on the genetics of pigmentation (see Hubbard et al. 2010). In all of our research endeavors, we include students and collaborators from far and wide. Mentorship of high school and undergraduate students is a large part of all of our research projects.